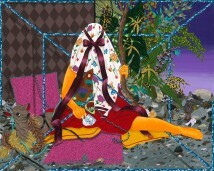 dubishiffartcollection.com | Dubi Shiff Art Collection | Fallah Amir H.
Fallah Amir H. (b. 1979, Iran) Lives and works in Los Angeles. He received his BFA from Maryland Institute College of Art in 2001 and his MFA from University of California, Los Angeles in 2005. Fallah has exhibited extensively in solo shows both in the United States and in the Middle East, at venues such as The Third Line, Dubai, Shulamit Nazarian, Los Angeles, Gordon Gallery, Tel Aviv and other significant international art institutions. His works are included in prominent collections such as The Salsali Private Museum Collection. His works are characterized with a colorful impressive aesthetic, which offers a new approach to the classic subject of the portrait.